Get your name on a jersey next to the superstars with this one of a kind, 11 x 14 New York Rangers Personalized Locker Room Print! The name of your choice will be digitally imposed on a jersey, and on the plaque above the jersey, in this framed photograph. Choose a name up to 12 characters long for the jersey and up to 14 characters long for the plaque. This is the perfect gift for the fan of all ages. 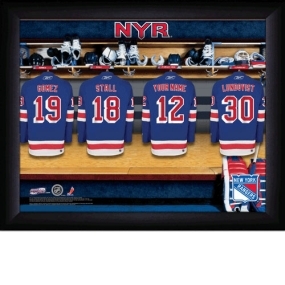 Get your New York Rangers Personalized Locker Room Print today! Please note that the jersey number on the print that you receive may differ than what is shown in the image. Active player numbers cannot be used. * Ships in approximately 3-5 business days. "Thank you so much for your exceptional customer service! I appreciate your quick response to my concerns. This has been a nice experience. Thanks again!"